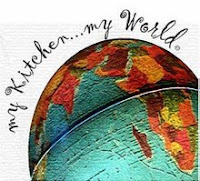 My Kitchen, My World is traveling to Ecuador this week and I have to admit, it's a country I know almost nothing about. I'm sure back in high school I could point it out on a map, but now ... well, I do know it's in South America. ;-) This is a great opportunity to brush up on Ecuadorian (Is that really a word?) trivia. Ecuador is located in South America, on the Pacific Coast. It is bordered on one side by Peru and on the other by Colombia. The Galapagos Islands are a part of Ecuador. It's capitol city is Quito. Ecuador is a major exporter of bananas, shrimp, flowers and oil. The Cotapaxi Volcano, located in Ecuador, is the highest active volcano in the world. There are 265 volcanoes within Ecuador, 19 of which are potentially active. Have I mentioned that I have a degree in Anthropology? Back in the day, I had dreams of traipsing around the world Indiana Jones-style, discovering all sorts of really cool things. Reality intervened. (It's hard to be footloose and fancy-free when you have four children! LOL!) Ecuador has a rich archaeological history. What that means is that I get to waste half my morning, pouring over pictures of really neat artifacts. 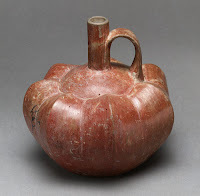 This style of bottle was produced in Ecuador from the 12th-4th century BC. This particular one is styled as a gourd. I think it's really cool. Enough with the history lesson. Let's eat! For this challenge, I decided to prepare my Ecuadoran meal at my mom's house, for mom and my sister and her family. I wasn't sure what I'd make to please a whole room of picky people but a quick Google turned up plenty of recipes for llapingachos, or potato patties. I went with the recipe from Living in the Kitchen with Puppies. Using someone else's stove and kitchen tools was definitely a challenge. I really missed my gas stove and heavy skillet! While my llapingachos didn't turn out as pretty as Natashya's, they still tasted great. Many of the recipes call for the potato patties to be topped with a peanut sauce. Since I don't like peanuts, I decided to go with a recipe from one of my favorite blogs Laylita's Recipes. 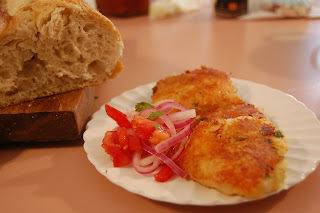 Layla is from Ecuador and has tons of delicio us looking recipe ideas on her blog. She has also posted a recipe for llapingachos, along with some gorgeous pictures. She suggested topping them with Curtido de cebolla y tomate. (Pickled Red Onion and Tomato Salad, in English.) It was delicious and very easy to throw together! I also made Locro, or Ecuadoran Potato Soup. For that, I used the recipe posted by our fearless leader over at She's Becoming Doughmesstic. Loved, loved, LOVED it! Might just become my new go-to potato soup recipe. 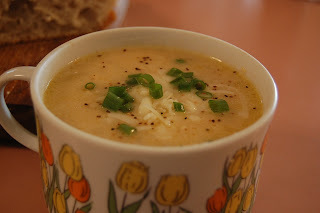 I used Muenster cheese and it gave the soup a wonderful flavor. Yum! Thanks to Shelby from The lives and Loves of Grumpy's Honeybunch for selecting such an interesting country! These dishes sound great. I was looking for a place to go next year and I wanted to go to a spanish speaking country. This makes me want to look into checking out ecuador!